Shipping: We will ship to all over the world! Shop the high quality Hp g60-243cl CPU cooler at low price now! How to replace the Hp g60-243cl fan? Follow your laptop owner's manual and assembly guide carefully as you disassemble the laptop. Work on a large table with a bright light source. Prepare a correct replacement Hp g60-243cl cpu cooler. If you are not sure which one is correct, please contact us. Turn off the laptop and unplug it. Remove the main battery, CD/DVD drive and the hard drive. The hard drive is usually located in a slot on one side of the laptop. Remove the screw that holds the cover in place, then pull out the hard drive sled. Remove all the screws (may not exist) that hold the keyboard in place, then lift the keyboard up and out. Unplug the flexible ribbon cable that connects the keyboard to the motherboard. Unplug the old Hp g60-243cl cpu fan. Remove screws that hold the heat sink and fan in place, then remove the entire unit from the laptop. Clean any thermal compound residue from the bottom of the heat sink and the CPU. Apply a thin and even layer of thermal compound on the CPU, then replace the old fan and fix the new fan. Replace the screws, plug back in, then reassemble the laptop. We provide 30 days money back guarantee. If the item is defective, we accept return and will redispatch brand new item. If you need return, please check twice to confirm that the item does not work and notify us within 7 days of delivery with detailed problem and send us some pictures for confirmation. Then get a unique address for return. We can’t receive the packages if buyers return by themselves according to the address on shipping package. We won’t solve such case and buyer should be responsible for the consequences. Any question, please contact us. We will work with you to solve any problems. Copyright © 2019 Laptopcpucooler.com. All Rights Reserved. All offers and prices are subject to change without prior notice. Designated trademarks and brands are the property of their respective owners. 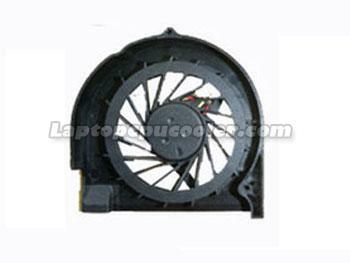 The Hp g60-243cl cooling fan replacement image is only to be used as a point of reference.